I love surrounding myself in books so coming up with unique ways to display them is something I really enjoy. I have found several ideas for rustic bookcases that are super unique and easy to put together. Our cabin is stocked full of the old classics and other antique books that seem especially fitting for relaxed reading in a cozy atmosphere. I didn’t want just a traditional bookcase there, so my husband built me a fun bookcase out of the shell of a canoe. 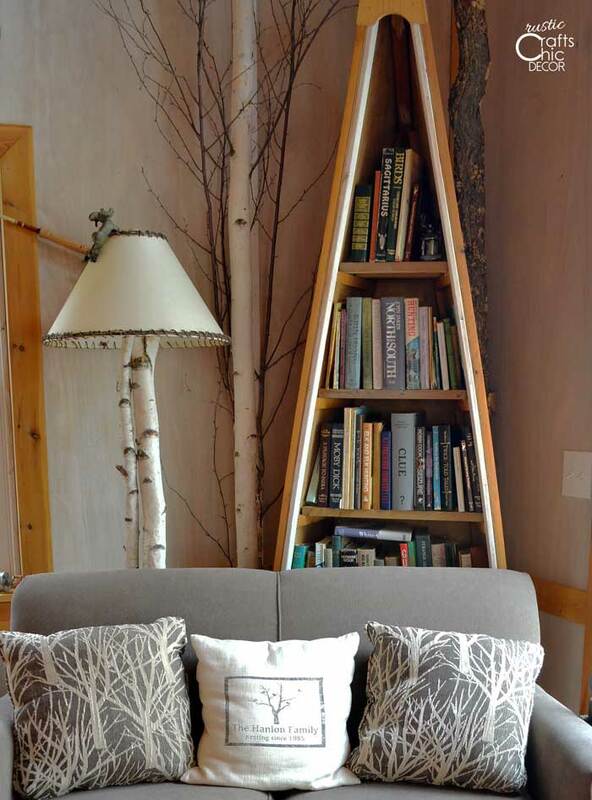 You can see how to easily make your own with this tutorial on making a canoe bookcase. That is just one unique way for displaying books. I found several others, in a rustic theme, that are both easy and fun to look at. Pull out your books and try one of these ideas to warm up a room and keep your books well within reach! Old ladder book shelf by Dandelion Express. Who would have thought that an old worn ladder could look so good on the wall when it is filled with books! I love the warm rustic look plus it gives a brand new use to a ladder that has seen its better day……as a ladder that is! Pallet bookshelf by Creative Outlets Of A Thrifty Minded Momma. 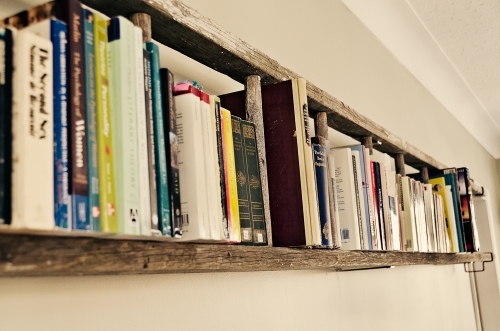 Pallets make a great book rack to place on the wall. 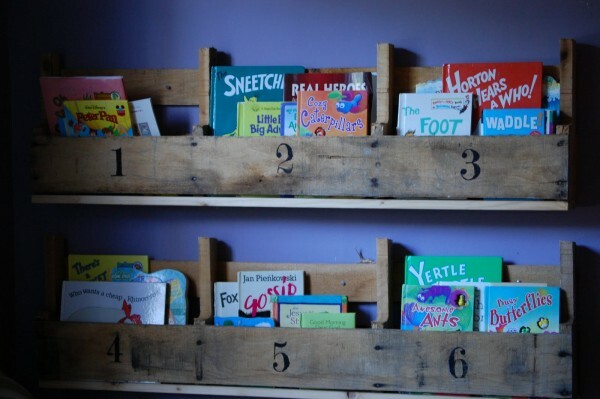 This particular bookshelf, which is sectioned off and numbered, is perfect for storing kids books. The way that they slip into the compartments makes the book covers easy to see and find. Literal book shelves by Real Simple. 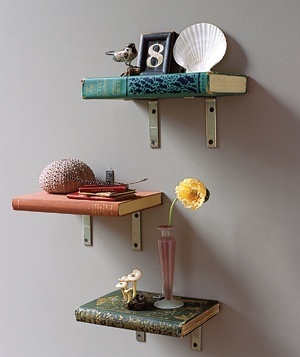 A super simple idea is to make a literal book shelf. Just place an old book on brackets and wa-la! This is good for displaying those books that you probably would never read. Just seeing them on display adds some nostalgic warmth to a room. Ladder bookcase idea by Indulgy. 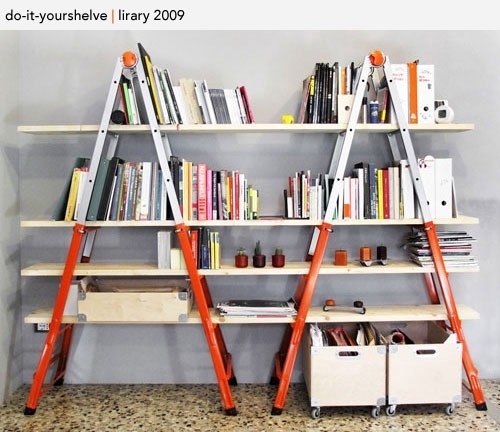 Here is a different kind of ladder bookcase idea using two stand up ladders holding boards. This would be fun with wooden ladders as well. 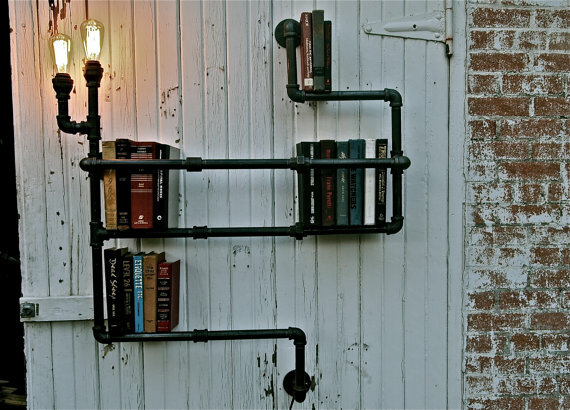 Pipe bookshelf by Stella Bleu Designs. And finally, I found this cool pipe book shelf unit for sale on Etsy. It even includes some lighting! I love the rustic industrial design of this one and the books do a nice job of warming up the cool metal.